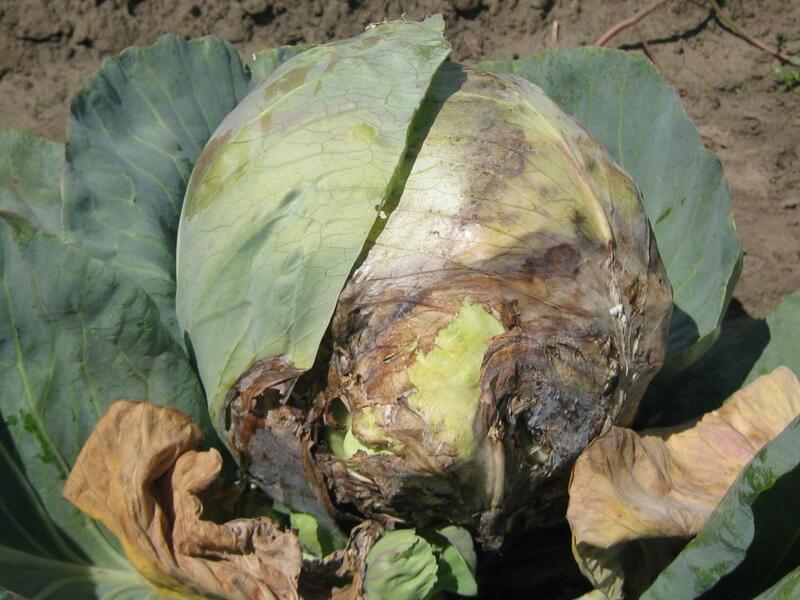 Soilborne diseases can be a major limitation to crop production, particularly for vegetables. They are often difficult to control, even with conventional strategies. Fungal, plasmodiophorid, oomycete, and bacterial pathogens, as well as viruses and plant parasitic nematodes, may all cause soilborne diseases. Important soilborne fungal pathogens are species of Fusarium (Fig. 1), Rhizoctonia (Fig. 2), Verticillium, and Sclerotinia (Figs. 3–5). Important Phytomyxea (plasmodiophorids) pathogens are species of Plasmodiophora (Fig. 6) and Spongospora. Important oomycete pathogens include Phytophthora (Figs. 7 and 8) and Pythium (Fig. 9). Many soilborne fungi persist in soil for long periods because they produce resistant survival structures such as melanized hyphae, chlamydospores, oospores, and sclerotia. Important soilborne bacterial pathogens are Ralstonia (Fig. 10), Pectobacterium, Agrobacterium, and Streptomyces. Pathogens in the Pseudomonas and Xanthomonas groups usually persist in the soil for only a short time. Soilborne viruses that affect vegetables are few in number and generally survive only in the living tissues of the host plant or in the nematode or fungal vectors that transmit them. An exception is the Tombusvirus group, in which the viruses can survive in the soil without being inside a host plant or vector. 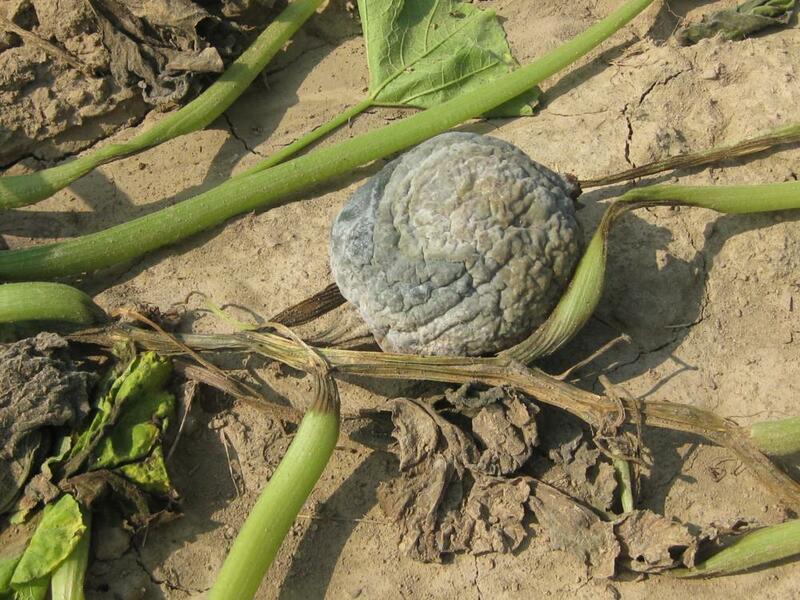 Soilborne plant parasitic nematodes affect vegetables by reducing plant vigor and growth. 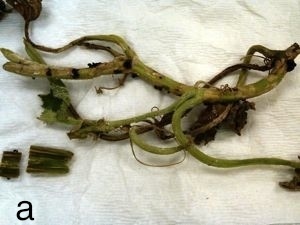 Important plant parasitic nematodes are root knot and cyst nematodes. Soilborne pathogens often survive for long periods on host plant debris, soil organic matter, or as free-living organisms. Each vegetable crop may be susceptible to several pathogens. Many soil factors including soil type, texture, pH, moisture, temperature, nutrient levels, and ecology affect the activity of soilborne pathogens. Some diseases caused by soilborne pathogens may be difficult to diagnose due to the absence of characteristic symptoms. Typical aboveground symptoms are wilting, chlorosis (yellowing), and stunting. Root symptoms include swellings (galls, knots, and clubs), lesions, rotting of root tips and fine lateral roots, and loss of root cortical tissue (rat tails). It may be necessary to enlist the help of an experienced pathologist or plant diagnostic clinic for assistance in diagnosis. See the National Plant Diagnostic Network web page for a list of plant clinics by state. Crops should be monitored regularly; walk in a zigzag pattern across the field to maximize the chance of finding problems. Written records of disease outbreaks should be kept for each field because soilborne pathogens persist in soil for long periods of time. Crop health assessments should include disease incidence, disease severity, and crop loss estimates—all key factors when considering control strategies. Planting pathogen-free and high-quality vegetable seed is a critical first step in managing diseases. Further information on organic seed selection can be found in the eOrganic article Sourcing Certified Organic Seed and the National Organic Program Regulations. This is particularly important for vegetatively propagated material such as tubers, bulbs, and slips. True seed can also contain pathogens, however, and all can serve as the source of entry of pathogens into new areas. Good management practices and seed storage prior to planting are essential for reducing diseases caused by soilborne pathogens such as Rhizoctonia (stem canker/black scurf) and Fusarium (dry rot), and secondary bacterial soft rot in cut potato seed. In conventional production, seed is often treated with chemical fungicides to reduce seed and seedling losses. Most seed protectants are not an option for organic growers; however, there are some seed treatments—such as priming, pelletizing, and the use of National Organic Program (NOP)-compliant protectants—that can be used by organic growers to improve seed performance. For more information on organic-approved seed treatments, see the related eOrganic article Organic Seed Treatments and Coatings. Many cultivars (varieties) of vegetables have been developed that are resistant or tolerant to specific diseases. The terms resistance or tolerance refer to a plant’s ability to overcome, to some degree, the effect of the pathogen. Typically, varieties labeled resistant to a particular disease have a higher level of resistance than those labeled tolerant. No variety is resistant or tolerant to all pathogens. For example, tomato hybrids acceptable for the fresh market tomato industry with resistance to fusarium wilt, fusarium crown rot, root-knot nematodes, and verticillium wilt (but not other diseases) are widely available commercially. Therefore, resistant varieties should always be used in combination with other management practices for a complete management program. Further information on disease resistant and/or tolerant vegetable varieties can be found in the Cornell University Vegetable MD Online database. In recent years, grafting of solanaceous (tomato, eggplant, pepper) and cucurbit (melon, cucumber, watermelon) scions onto compatible disease-resistant rootstocks has become a means to raise popular varieties susceptible to certain diseases in fields infested with those pathogens. 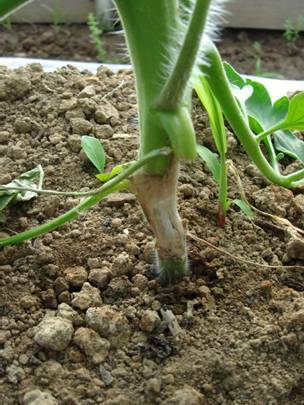 Grafting can be used to manage soilborne diseases such as bacterial wilt and root knot nematode of solanaceous vegetables and fusarium wilt of cucurbits (Bruton, 2005; Rivard and Louws, 2006). While grafting can protect vegetable crops from some soilborne diseases, rootstocks are not resistant to all diseases. Knowledge of the causal agents of crop problems is necessary to select appropriate resistant varieties. The addition of organic matter such as cover crop green manure (single and mixed species), seed meals, dried plant material, good quality compost, organic waste, and peats can aid in reducing diseases caused by soilborne pathogens. Several studies have shown that organic matter amendments can be very effective in controlling diseases caused by pathogens such as Fusarium spp. (Klein et al., 2011), Pythium spp. (McKellar and Nelson, 2003; Veeken et al., 2005), Rhizoctonia solani (Diab et al., 2003) and Sclerotinia spp. (Lumsden et al., 1983). Organic matter improves soil structure and its ability to hold water and nutrients; it also supports microorganisms that contribute to biological control. Our study (Baysal et al., 2008) has shown that mixed-hay cropping during the transition periods can enhance soil suppressiveness to damping-off caused by Pythium and Phytophthora; in addition, although compost amendments applied during transition can improve crop vigor by significantly enhancing soil fertility, their effects on soilborne diseases are not predictable when transitioning to certified organic production. Organic matter amendments have great potential. However, they sometimes can cause inconsistent control, increased disease severity, and phytotoxicity. Correct management of crop residues and wastes is necessary to avoid phytotoxic effects. This can be achieved by optimizing application rates and proper timing between organic matter application and planting of the vegetable crop. In the early stages of decomposition—especially when the available oxygen is low (as in saturated soil)—crop planting should be avoided, or at least delayed, to avoid phytotoxicity and/or diseases caused by Pythium and related pathogens. Phacelia, Austrian winter pea and lana woollypod vetch cover crops can increase the number of sclerotia of Sclerotinia minor (Koike et al., 1997). Vetch is a known host of root-knot nematode (Meloidogyne species) and also might increase populations of Pythium and Rhizoctonia which cause damping-off. 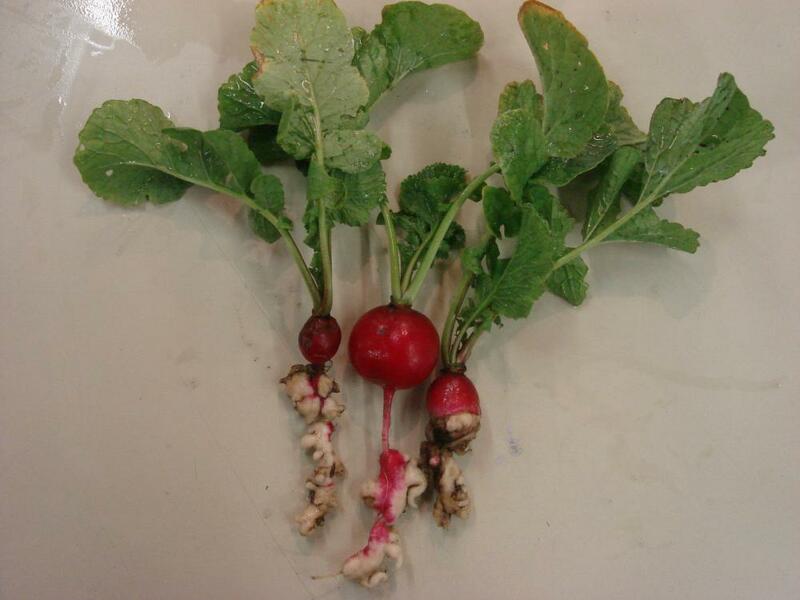 Although oilseed radish could be a potential trap crop for cyst nematode (Heterodera species), as a cover crop it is a host of root-knot nematode and the clubroot pathogen (Plasmodiophora brassicae). Grower management of brassica cover crop residues could greatly affect biofumigation effectiveness. For maximum effect, residues need to be completely shredded and immediately incorporated into moist soil. Vegetables can be either transplanted or direct-seeded. Transplants can escape damping-off and certain root rot problems if sterilized soilless growing medium is used and seedlings are properly managed. Overwatering and temperature extremes should always be avoided during transplant production. For direct-seeded vegetables, good soil drainage through proper soil preparation helps reduce soilborne disease. In heavier soils, shallow planting is recommended to reduce the risk of damping-off disease problems. Raised beds are ideal for vegetable production (of nonvining cucurbit crop types). They help prevent damage from soil compaction and flooding. Optimum plant spacing helps to increase airflow around the plants and minimize relative humidity and leaf wetness, which many pathogens need to infect foliar plant tissue. Organic mulches aid in disease prevention by reducing direct contact between soil and the above-ground portions of the plant. Many soilborne pathogens infect the plant from rain-splashed soil on the lower leaves. Irrigation management is clearly an important factor for soilborne disease control. Regardless of the irrigation method, timing, frequency, and amount are critical. Over-watering in poorly drained soils must be avoided to prevent soilborne diseases and seed decay. In research on irrigation methods, lettuce drop incidence was significantly lower and yields were higher in plots under subsurface drip irrigation compared with furrow irrigation (Subbarao et al., 1997). The selection and application of fertilizers can significantly influence disease development. For example, liming the soil to raise pH levels can reduce symptom expression for clubroot disease of crucifers and help manage bacterial wilt of tomato. The combination of high-nitrate, low-ammonium fertilizers and application of lime can also provide significant control of fusarium wilt and fusarium crown rot of tomato (Woltz and Jones, 1973; Woltz et al., 1992). Many pathogens survive between crops in or on the residue from diseased plants, so it is important to remove or destroy as much of the old plant debris as possible. Tillage procedures should also reduce plant residues left from previous crops. 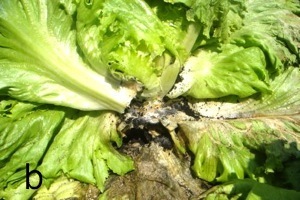 For example, when lettuce drop or white mold is observed in a production field, the diseased plants and soil immediately surrounding them should be removed, to reduce the number of sclerotia (long-term survival structures of the pathogen) in the soil. Weeds should be eliminated as they may harbor pathogens or serve as hosts; they also increase the relative humidity around the crop plants, favoring disease development. Equipment should be cleaned by power washing between fields. For crops such as tomatoes that are handled often for procedures such as training, pruning and harvesting, hands and tools should be cleaned regularly. Sanitation measures are especially important in greenhouse crop production systems. Greenhouse vegetable crops are to a large extent produced in soilless cultures. Soilless cultures were initially used as a method to eliminate soilborne pathogens. However, vegetable crops in soilless cultures are also affected by the same soilborne pathogens (Pythium, Phytophthora, Fusarium, and Rhizoctonia) as crops in soil. The advantage of soilless cultures is that the roots are confined to a small volume of medium or water, and that pathogens can be controlled relatively easily. The growing medium can be replaced or sterilized after usage. The source water, recycled nutrient solution, and runoff from a bag culture in a recirculating system can be treated. There are many different methods available: heat pasteurization, UV radiation, chlorine treatment, slow sand filtration, ultrafiltration, micropore filtration, and biofiltration. Work surfaces, tools, gloves, boots, hoses, walkways, carts, tractor tires, plows, tanks, and water supply lines in greenhouses, shade houses, storage rooms, and field operations need to be cleaned and disinfested with a disinfectant (such as chlorine materials and hydrogen peroxide) or steam. Surface disinfectants are allowed with restrictions. For more information on approved disinfectants, see the National Organic Program (NOP) standards and Can I Use This Input on My Organic Farm? Infected plants need to be removed and infected plant materials must be safely disposed of by deep burying or incinerating. Soil solarization is a preplant and hydrothermal procedure that uses transparent film to capture solar radiation in the soil. The plastic sheets allow the sun’s radiant energy to be trapped in the soil, heating the upper layers. Solarization has gained popularity among greenhouse and high tunnel (hoop-house) vegetable growers. Application of soil solarization for open field soil disinfestation has been limited to small areas in geographic regions with a period of high temperature and abundant sunshine. Solarization during the hot summer months can increase soil temperature to levels that kill many important soilborne fungal and bacterial plant pathogens, including Verticillium dahlia, certain Fusarium spp., Sclerotinia spp., Agrobacterium tumefaciens, Streptomyces scabies, nematodes, and weeds. The major limitations for adoption of soil solarization in practice are the relatively long duration of the process and the climatic dependency. The University of California maintains a website (Stapelton, 2012) with information on soil solarization for homeowners, commercial growers, and natural resources users, including detailed recommendations. Anaerobic soil disinfestation works by creating anaerobic soil conditions by incorporating easily decomposable organic materials (wheat bran, molasses, rice straw, and rice bran, for example) into soil that is irrigated and subsequently covered with plastic film. The advantage of anaerobic soil disinfestation over soil solarization is that the method does not require high solar radiation so it can be applied to cloudy areas or periods of low sunlight, thus a growing season is not lost. In practice, 1–2 Mg of organic material are added to each 1,000 m2 (roughly 5–10 tons acre-1) of soil treated (Shinmura, 2004). Anaerobic soil disinfestation using wheat bran or molasses proved to be effective against a wide range of soilborne pathogens, including Fusarium oxysporum f. sp. lycopersici, Verticillium dahliae, and Ralstonia solanacearum, as well as the nematodes Meloidogyne incognita and Pratylenchus spp. (Momma, 2008). For more information, see our eOrganic webinar on anaerobic soil disinfestation. Crop rotation is the foundation of disease management for many pathosystems and a very important tool in organic agriculture. Alternation with hosts that do not support growth and reproduction of the pathogen reduces the amount of soilborne inoculum. Sources of pathogen inoculum and recommended rotation periods for diseases of vegetables in the northeastern U.S. are available at Crop Rotation on Organic Farms: A Planning Manual (Mohler and Johnson, 2009). A good rotation arrangement is to treat members of the same plant family as a group and rotate based on groups rather than individual crops. For example, lettuce should be rotated with cucurbit, tomato, or cole crops but not other types of lettuce, chicory, or endive. It is important to note that one difficulty in using crop rotation to control some diseases is the limited availability of crops for rotation. For example, Sclerotinia on cabbage is difficult to manage with rotation because dicot plants are hosts of Sclerotinia and the pathogen can survive for long periods between host crops. Peppers should not be rotated with cucurbits, as both are susceptible to phytophthora blight. Green manure or cover crops can be part of the crop rotation. When selecting cover crops on the basis of disease suppression, caution should be taken because the effects can be cultivar specific. Broccoli (Brassica oleracea), used as a green manure, has been shown to reduce the number of S. minor sclerotia in soil (Hao and Subbarao, 2003). Intercropping is defined as the cultivation of a mixture of two or more crops together in the same area. There are various types of intercropping (row intercropping, strip intercropping, mixed intercropping, and relay intercropping), each of which may affect soilborne pathogens differently. Intercropping systems can be characterized according to the degree to which roots of different crop species interact, which is determined not only by the intercropping system but also by the root architecture of each of the crops in the mixture (de Kroon, 2007). Disease-suppressive mechanisms such as host dilution, allelopathy, and enhanced antagonistic populations play crucial roles for soilborne disease reduction in intercropping systems. Reduction in plant pests and weeds has also been reported (Baumann et al., 2002; Bukovinszky, 2004). Intercropping of compatible plants also encourages biodiversity by providing a habitat for beneficial insects and soil microorganisms. When preventive and cultural methods for soilborne disease control are insufficient to manage a disease, National Organic Program (NOP)-compliant inputs (USDA–ARS, 2012) can be applied. NOTE: Before applying ANY disease or pest management product, be sure to: 1) read the label to be sure that the product is allowed for the crop and the disease you intend to control; 2) read and understand the safety precautions and application restrictions; and 3) make sure that the brand name product is listed in your Organic System Plan and approved by your certifier. For more information on how to determine whether a disease management product can be used on your farm, see Can I Use this Product for Disease Management on my Organic Farm? Applications of copper products may provide some protection against the foliar phase of phytophthora blight, a soilborne disease. However, over-application can lead to copper accumulation in the soil, contamination of runoff water, and toxicity to non-target organisms. Biorational products represent an important option for the management of plant diseases. Streptomyces griseoviridis&emdash;commercially known as Mycostop&emdash;and species of Trichoderma are among the microorganisms most commonly used for biocontrol in soil. Both agents are used for the control of root diseases caused by Pythium, Phytophthora, Rhizoctonia and Fusarium. The strain T-22 of Trichoderma harzianum is effectively used for seed treatment. Kodiak (Bacillus subtilis GB03) and Actinovate (Streptomyces lydicus) are also used for seed treatment. Contans® (Coniothyrium minitans) has been effective in reducing the incidence of lettuce drop by as much as 50% (Budge and Whipps, 2001). It is also effective for white mold. Biochemical biopesticides (extract of Chenopodium and thyme oil, for example) can be used for soilborne disease management. Microbial inoculants to promote plant growth and enhance resistance have been developed and field tested for soilborne disease management. A list of biorationals and up-to-date information regarding OMRI approval is available at the following database http://attra.ncat.org/attra-pub/biorationals/. For more information, see the Ohio State University Extension Fact Sheet Biopesticide Controls of Plant Diseases: Resources and Products for Organic Farmers in Ohio (Cao et al., 2010). Figure 1. (a) Fusarium wilt of melon (Fusarium oxysporum). (b) Close-up of fusarium wilt on melon stem. Photo credit: Fulya Baysal-Gurel, The Ohio State University. Figure 2. 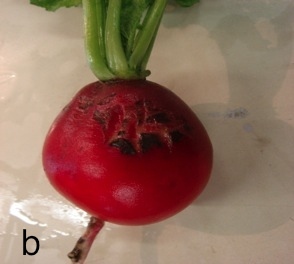 (a) Rhizoctonia root and hypocotyl rot of radishes (Rhizoctonia solani). (b) Close up of rhizoctonia root and hypocotyl rot on radish. Photo credit: Jhony Mera and Fulya Baysal-Gurel, The Ohio State University. Figure 3. White mold of cabbage (Sclerotinia sclerotiorum). Photo credit: Jhony Mera, The Ohio State University. Figure 4. Tomato white mold (Sclerotinia sclerotiorum). Photo credit: Fulya Baysal-Gurel, The Ohio State University. Figure 5. (a) Lettuce drop (Sclerotinia minor). (b) Close up of lettuce drop (Sclerotinia minor) on lettuce. Photo credit: Sally A. Miller, The Ohio State University. Figure 6. 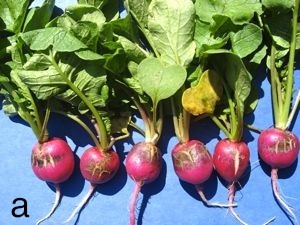 Clubroot of radish (Plasmodiophora brassicae). Photo credit: Jhony Mera, The Ohio State University. Figure 7. 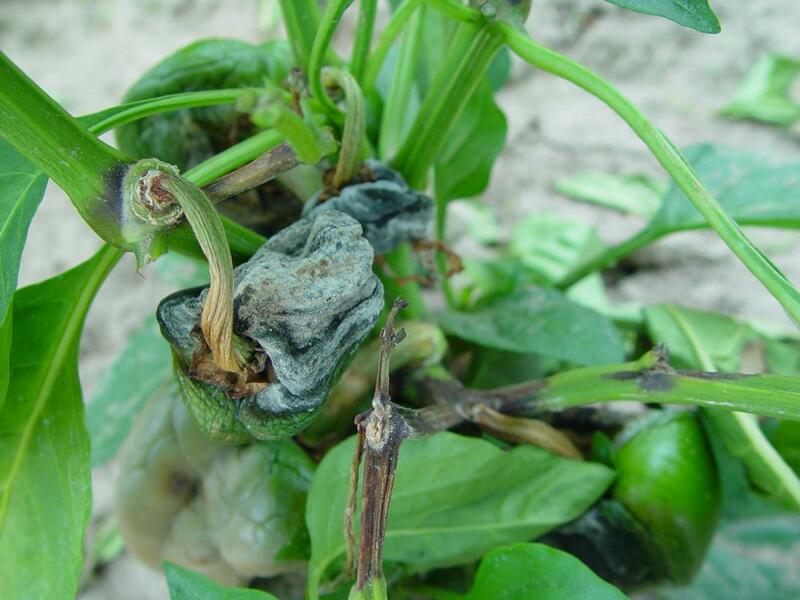 Phytophthora blight and fruit rot of pepper (Phytophthora capsici). Photo credit: Jhony Mera, The Ohio State University. Figure 8. 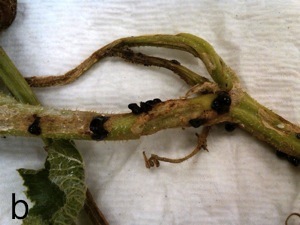 Phytophthora blight of winter squash (Phytophthora capsici). Photo credit: Jhony Mera, The Ohio State University. 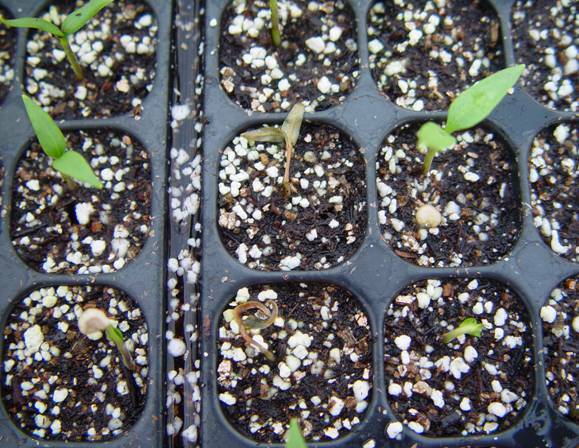 Figure 9. Pepper damping-off (Pythium spp.). Photo credit: Fulya Baysal-Gurel, The Ohio State University. Figure 10. 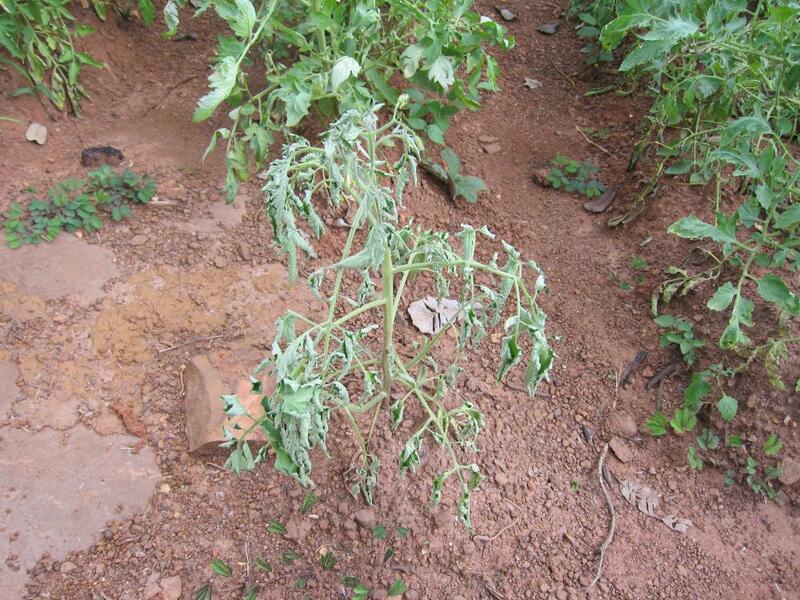 Tomato bacterial wilt (Ralstonia solanacearum). Photo credit: Sally A. Miller, The Ohio State University. Baumann, D. T., L. Bastiaans, and M. J. Kropff. 2002. Intercropping system optimization for yield, quality, and weed suppression combining mechanistic and descriptive models. Agronomy Journal 94: 734–742. (Available online at: https://www.agronomy.org/publications/aj/abstracts/94/4/734) (verified 20 June, 2012). Baysal, F., M. S. Benitez, M. D. Kleinhenz, S. A. Miller, and B. McSpadden Gardener. 2008. Field management effects on damping-off and early season vigor of crops in a transitional organic cropping system. Phytopathology 98: 562–570. (Available online at: http://dx.doi.org/10.1094/PHYTO-98-5-0562) (verified 20 June, 2012). Bruton, B. 2005. Grafting watermelon onto squash or gourd rootstock makes firmer, healthier fruit. Agricultural Research 53(7): 8–9. (Available online at: www.ars.usda.gov/is/AR/archive/jul05/fruit0705.htm) (verified 20 June, 2012). Budge, S. P., and J. M. Whipps. 2001. Potential for integrated control of Sclerotinia sclerotiorum in glasshouse lettuce using Coniothyrium minitans and reduced fungicide application. Phytopathology 91: 221–227. (Available online at: http://dx.doi.org/10.1094/PHYTO.2001.91.2.221) (verified 20 June, 2012). Bukovinszky, T. 2004. Tailoring complexity: Multitrophic interactions in simple and diversified habitats. PhD Thesis. Wageningen University, Wageningen, The Netherlands. (Available online at: http://edepot.wur.nl/121580) (verified 20 June, 2012). Cao, C., S. Park, and B. B. McSpadden Gardener. 2010. Biopesticide controls of plant diseases: Resources and products for organic farmers in Ohio [Online]. Available at: http://ohioline.osu.edu/sag-fact/pdf/0018.pdf (verified 20 June, 2012). de Kroon, H. 2007. How do roots interact? Science 318: 1562–1563. (Available online at http://dx.doi.org/10.1126/science.1150726) (verified 20 June, 2012). Diab, H., S. Hu, and D. M. Benson. 2003. Suppression of Rhizoctonia solani on impatiens by enhanced microbial activity in composted swine waste amended potting mixes. Phytopathology 93: 1115–1123. (Available online at: http://dx.doi.org/10.1094/PHYTO.2003.93.9.1115) (verified 20 June, 2012). Dufour, R. ATTRA Biorationals: Ecological Pest Management Database [Online]. Available at: http://attra.ncat.org/attra-pub/biorationals/ (verified 20 June, 2012). Hao, J., and K. V. Subbarao. 2003. Effects of broccoli rotations on lettuce drop caused by Sclerotinia minor and on the population density of sclerotia in soil. Plant Disease 87: 159–166. (Available online at: http://dx.doi.org/10.1094/PDIS.2003.87.2.159) (verified 20 June, 2012). Klein, E., J. Katan, and A. Gamliel. 2011. Soil suppressiveness to Fusarium disease following organic amendments and solarization. Plant Disease. 95: 1116–1123. (Available online at: http://dx.doi.org/10.1094/PDIS-01-11-0065) (verified 20 June, 2012). Koike, S., R. Smith, L. Jackson, L. J. Wyland, W. E. Chaney, and J. I. Inman. 1997. Cover crops can increase lettuce drop. California Agriculture 51(1): 15–18. January-February 1997. (Available online at: http://californiaagriculture.ucanr.org/landingpage.cfm?articleid=ca.v051n01p15) (verified 20 June, 2012). Lumsden, R. D., J. A. Lewis, and P. D. Millner. 1983. Effect of composted sewage sludge on several soilborne pathogens and diseases. Phytopathology 73: 1543–1548. (Available online at http://www.apsnet.org/publications/phytopathology/backissues/Documents/1983Abstracts/Phyto73_1543.htm) (verified 20 June, 2012). McKellar, M. E., and E. B. Nelson. 2003. Compost induced suppression of Pythium damping-off is mediated by fatty-acid metabolizing seed-colonizing microbial communities. Applied and Environmental Microbiology 69: 452–460. (Available online at: http://dx.doi.org/10.1128/AEM.69.1.452-460.2003 (verified 20 June, 2012). United States Department of Agriculture – Agricultural Marketing Service. 2012. National Organic Program [Online]. Available at: http://www.ams.usda.gov/nop/ (verified 20 June, 2012). National Plant Diagnostic Network [Online]. Available at: http://www.npdn.org/ (verified 20 June, 2012). Rivard, C., and F. Louws. 2006. Grafting for disease resistance in heirloom tomatoes. North Carolina, USA, North Carolina Cooperative Extension Service, North Carolina State University. (Available online at: http://www4.ncsu.edu/~clrivard/TubeGraftingTechnique.pdf) (verified 20 June, 2012). Shinmura, A. 2004. Principle and effect of soil sterilization method by reducing redox potential of soil. Pytopathological Society of Japan Soilborne Disease Workshop Report, 22: 2–12. Subbarao, K. V., J. C. Hubbard, and K. F. Schulbach. 1997. 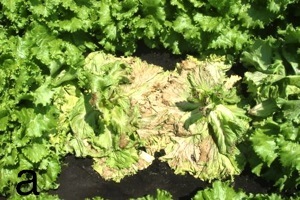 Comparison of lettuce diseases and yield under subsurface drip and furrow irrigation. Phytopathology 87: 877–883. (Available online at: http://dx.doi.org/10.1094/PHYTO.1997.87.8.877) (verified 20 June, 2012). Stapelton, J. J. 2012. Passive solar disinfestation of soil, pests and structural materials [Online]. Agriculture and Natural Resources, University of California. The Regents of the University of California. Available at: http://ucanr.org/sites/Solarization/ (verified 1 Aug 2012). Veeken, A.H.M., W. J. Blok, F. Curci, G.C.M. Coenen, A. J. Temorshuizen, and H.V.M. Hamelers. 2005. Improving quality of composted biowaste to enhance disease suppressiveness of compost-amended, peat based potting mixes. Soil Biology and Biochemistry 37: 2131–2140. (Available online at http://dx.doi.org/10.1016/j.soilbio.2005.03.018) (verified 20 June, 2012). Vegetable MD Online [Online]. Department of Plant Pathology, Cornell University. Available at: http://vegetablemdonline.ppath.cornell.edu/ (verified 20 June 2012). Woltz, S. S., and J. P. Jones. 1973. Interactions in source of nitrogen fertilizer and liming procedure in the control of Fusarium wilt of tomato. HortScience 8: 21–22. Woltz, S. S., J. P. Jones, and J. W. Scott. 1992. Sodium chloride, nitrogen source, and lime influence Fusarium crown rot severity in tomato. HortScience 27: 1087–1088. (Available online at http://hortsci.ashspublications.org/content/27/10/1087.abstract) (verified 20 June, 2012).